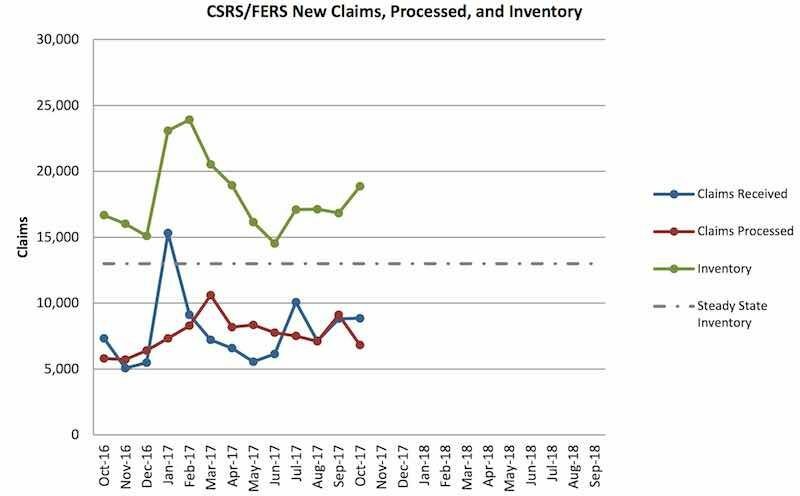 The backlog of outstanding retirement claims at the Office of Personnel Management spiked last month, jumping just over 12% to a total of 18,860. At the end of September, the backlog stood at 16,828. That was higher than it was a year ago when it was at 16,677 at the end of last October. In fact, the backlog spiked 10% in October 2016, yet it still was 13% lower at that time than it is today. By way of comparison, at the end of October 2015 the backlog was 12,642, and at the end of October 2014 it was 14,137. Despite the backlog’s recent upward trend, it was a lot worse in the past. At the end of October 2012, the backlog stood at 37,086. And in July 2012, it was at 44,679. Given that 13,000 appears to be the agency’s goal, it’s noteworthy that the last time the backlog was at or below that level was at the end of December 2015. The latest backlog data published by OPM are included below.